Modular bounce house with slide and Pool. Add an art panel to match your parties’ theme. A great bouncer for those hot summer days. Includes safety-step entrance/exit and 360-degree netting to make easy to watch your kids. Has a water slide at the front and a safety entrance/exit. 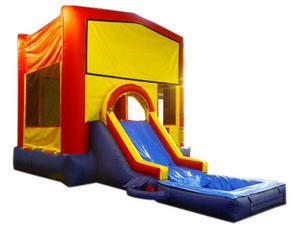 The kids will have a great time in this inflatable bounce house-water slide!